The New Japan Cup semi-finals were, on paper, a bit of a foregone conclusion. The Ace was in one match and his successor in the other, if you were gambling on it, you’d have bet on them both going to the final, right? You’d have also been wrong. Let’s talk about Tomohiro Ishii. I love that man. He’s everything I want in a wrestler not because he’s a generational talent like Okada or Tanahashi. Not because he has the charisma of Naito or the magic of Ibushi. It’s not even because he’s an incredible wrestler like Zack Sabre Jr. No, it’s because, ultimately, he’s a loser. What a loser he is, though. He went into the New Japan Cup semi-final as the underdog in every sense of the word. Okada is his stable leader, the pretty boy who is not only an incredible wrestler but has been sculpted for success from day one. He’s everything Ishii isn’t, yet Ishii went in there, spat in his eye and dared him to bring in. Okada had to bring it too because Ishii was incredible here. Time after time he hit the floor only to bounce back up, staggering but still roaring defiance. Then there was the way The Stone Pitbull headbutted through one Rainmaker before shrugging off half of another as if it were just another move. Tomohiro Ishii had his chance to reach the final of the New Japan Cup, and he threw himself at Okada. This weirdly shaped, ageing wrestler who has only ever sniffed the top was going to force his boss to kill him if he wanted to regain his title. And, of course, he still lost. Because that’s what Tomohiro Ishii is, he’s a loser. He is a beautiful, talented, perfect loser. He’s the average guy who works hard every day, who scratches and fights to make themselves better and who so clearly deserves to be the man, but never will be. Tomohiro Ishii will never be the man because the kid sitting across the desk from his has it, and Ishii never will. Yet, what Ishii has (and you argue whether it means anything or not) is respect. At the end of this match, Okada didn’t celebrate or gloat. Instead, he got down on his knees, and he helped Ishii, his friend, to his feet. Because whether he’s the man or not, Tomohiro Ishii has earned the respect of every single person who steps in that ring with him. And, after Okada helped Ishii to his feet, The Stone Pitbull, a man who appears to have as much time for people as the average rock has for philosophy, raised Captain Kazu’s hand and gave his respect right back. One suspects that will mean a lot more to Okada than he would ever let on. I don’t know if I ever actually got around to reviewing the match there. It was stunning. Ishii was transcendent while Okada was right there with him. Watch it. After Kazuchika Okada and Tomohiro Ishii went to war, Hiroshi Tanahashi and Sanada came out to class the joint up. There might not have been a single strike thrown in this match. If there was, there wasn’t a lot of them. It was a wrestling bout in the strictest sense of the word. It was also the second New Japan Cup appearance of Dickhead Tana. In my review of his match with Taguchi, I spoke about how incredible Tanahashi is at playing off the crowd. If you need further proof of that, watch the opening of this bout. Watch the momentary flicker of surprise on his face when the fans are so clearly pro-Sanada then marvel as he leans right into it. The way his poses start to take on an arrogance that wasn’t there before, and how he encourages them to not only not cheer him, but outright boo him. It’s a masterful display. One suspects that they were prepared for it too because the structure of this match suited Dickhead Tana perfectly. Early on, he slowed things right down, flooring Sanada and going to work on his legs. All tournament he’s used a combination of the Dragon Screw Leg Whip and the Cloverleaf to devastating effect, and he wasn’t going to stop now. It also suited Sanada because it is quickly becoming apparent that despite the fact he is ridiculously hot, he is at his best as an underdog babyface. The man comes alive when he’s wrestling from underneath, finding more and more elaborate ways to lock on that Skull End. If only he could learn to put it on a bit tighter, it would be perfect. What was perfect was the way they put together the closing stretch. It became a battle of the counters, as Tanahashi fought to escape the Skull End and Sanada struggled to keep it on. 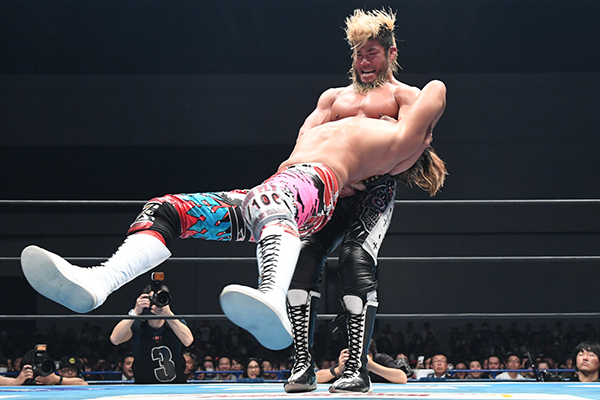 In the end, Sanada proved the master, bursting out of the Japanese Leg Roll he slipped straight into it, and in a moment that caught everyone off-guard, The Ace tapped. What a win for The Cold Skull. It was all enough to make me a bit gutted that the New Japan Cup is setting up Madison Square Gardens rather than Sakura Genesis. If it was an average year, you could have given Sanada the same title shot that Sabre took last time. However, MSG is a huge deal for this company, and with the G1 show in Dallas not selling as well as perhaps expected, one suspects Okada is off to the final. However, getting past Goto, Suzuki and Tanahashi isn’t a bad run by anyone’s standards. Perhaps the time of Seiya Sanada is finally here. So, Okada vs Sanada is our final and what a delightful way to get there. Tomohiro Ishii is the name that will linger in my mind when I think of this show, but truthfully, everyone brought it. Four great wrestlers had two great matches. Who knew it could be that simple?